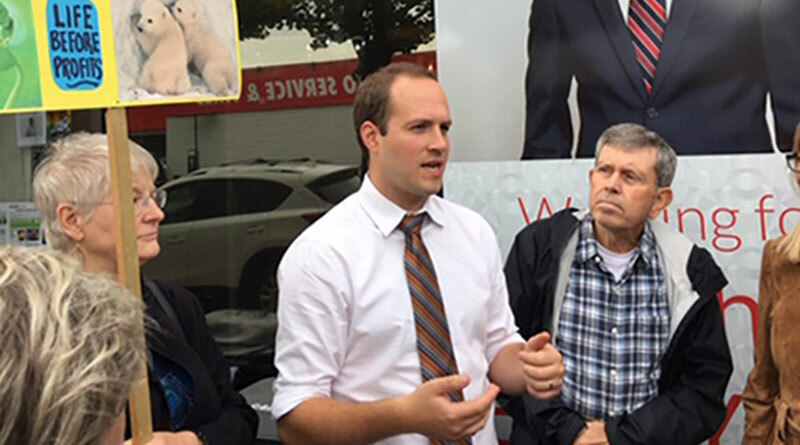 Photo courtesy Michael Van Dusen WARM CLIMATE: Beaches-East York MP Nathaniel Erskine-Smith discusses the need for an emergency debate on climate change outside his office on Danforth Avenue. Beaches-East York MP Nathaniel Erskine-Smith is seeking an emergency Parliamentary debate on climate change after being pressed by a group of local residents. The group presented him on Oct. 11 with copies of the recent United Nations’ report warning of the dire consequences of predicted rising global temperatures and heard him say he was calling for an urgent debate. “I have delivered a notice to the Speaker [of the House of Commons] to request an emergency debate, and will continue to be vocal with our government to build on our efforts to date and to take stronger action,” Erskine-Smith confirmed in an email Friday. The group who met with the MP was pleased to hear his response, said Michael Polanyi, a Cedarvale Avenue resident who organized the event. About 15 area residents gave copies of the UN’s Intergovernmental Panel on Climate Change (IPCC) report on climate change to Erskine-Smith at his office on Danforth Avenue on Thursday afternoon. They said it was part of a global action to deliver the climate report to decision-makers. Photo courtesy Michael Van DusenWARNING: MP Erskine-Smith receives a summary of the United Nations report warning of dire consequences of global warming. The group is self-described as local residents and members of local church and faith groups. They asked the MP to urge Prime Minister Justin Trudeau to end fossil fuel subsidies, stop pipeline expansions, and hold an emergency debate in Parliament to determine the necessary actions to keep global temperature increases below one and a half degrees. The IPCC report shows that keeping the rise in global temperature below 1.5 degrees will significantly reduce the likelihood of massive coastal flooding, deadly heatwaves, storms and wildfires, coral reef decimation, large-scale reductions in crop and fisheries yields, and species loss, according to a press release from the group.